Joined by United States Senator Chris Van Hollen, Maryland Attorney General Brian Frosh, Senator Susan Lee (District 16 – Montgomery), and Delegate Ned Carey (District 31A – Anne Arundel), Senator Jim Rosapepe (District 21 – Prince George’s and Anne Arundel) today introduced legislation designed to protect Marylanders from Wall Street abuses and to implement the recommendations of the Maryland Financial Consumer Protection Commission. 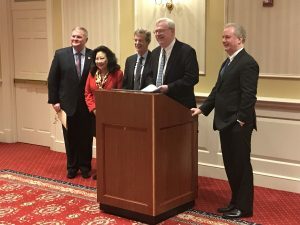 Senate Bill 786 and its companion House Bill 1127 (jointly known as the Financial Consumer Protection Act of 2019) seek to implement numerous Maryland Financial Consumer Protection Commission recommendations relating to cryptocurrency, data breaches, indirect automobile lending, the retail sale of manufactured homes, the ability to repay standard, the fiduciary duty standard, and the arbitration rule. “We need to protect Marylanders’ jobs, homes, and retirements,” said Rosapepe, the sponsor of Senate Bill 786. “As President Trump continues to roll back the Dodd-Frank Wall Street reforms, we need to act,” he reiterated. Senate Bill 670 and its companion House Bill 594 (titled Financial Institutions – Student Loan Services, Unfair, Abusive, or Deceptive Trade Practices) were jointly filed at the request of current Maryland Attorney General and former Maryland State Senator Brian Frosh. The legislation seeks to establish a bill of rights for student borrowers and to protect them from predatory loan practices. “With the lack of oversight at the federal level, it is more important now than ever for states to step up and fill in the gaps left by a retreating federal government,” said Attorney General Frosh. Along with lead sponsor Senator Rosapepe, Senate Bill 786 is cosponsored by Senators Lee (District 16 – Montgomery), Ferguson (District 46 – Baltimore City), and Washington (District 43 – Baltimore City). In describing the aims of the legislation, Senator Lee stated: “Maryland has to step up. We have to be the leader in consumer protection.” Senate Bill 786 has been assigned to the Senate Finance Committee and no hearing information is available at this time. 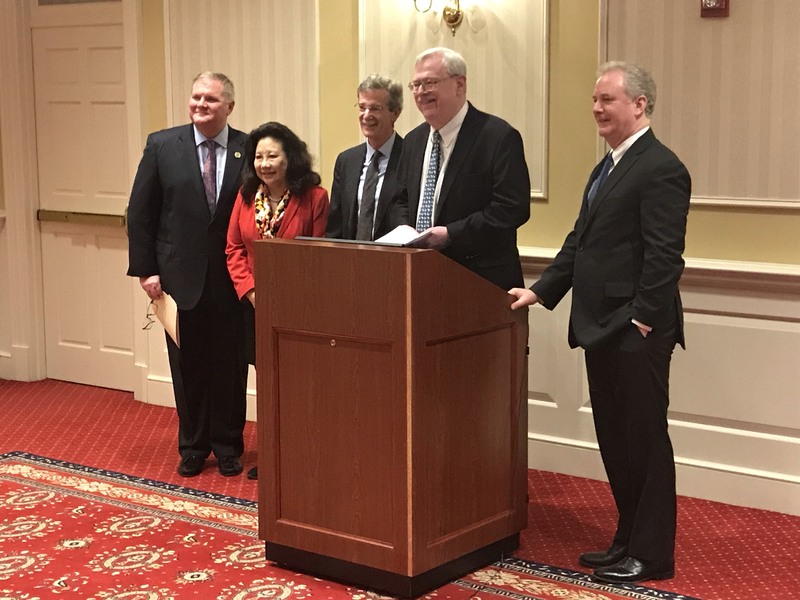 Senate Bill 670 was introduced by Senate President Thomas V. Mike Miller, Jr. (District 27 – Prince George’s, Charles, and Calvert) at the request of Maryland Attorney General Brian Frosh. It is cosponsored by Senators Augustine (District 47 – Prince George’s), Guzzone (District 13 – Howard), Kelley (District 10 – Baltimore County), King (District 39 – Montgomery County), Lee, Peters (District 23 – Prince George’s), Pinsky (District 22 – Prince George’s), and Rosapepe (District 21 – Prince’s George’s and Anne Arundel). It has also been assigned to the Senate Finance Committee and no hearing information is available at this time.